Expecting a haul of SFr9.3 million ($9.6 million) for the sale of 97 works of Swiss art, Sotheby’s Zurich registered a dismal result of SFr4.7million on Monday with many works unsold and others only just reaching their reserve price. Major auction houses Sotheby’s, Christie’s and Koller have been organising sales dedicated to Swiss art for more than 20 years. A recent surge of attention in historic Swiss artists, helped by major exhibitions, has driven prices up and released on the market a wealth of works hitherto held in private collections. Monday’s result indicates that the pace may now slow down. Four works, three paintings and an aquarelle by Giovanni Giacometti, including Valle Fiorita pictured above (estimated SFr1.2-1.8 million), did not sell, nor did the portrait of a schoolboy by Albert Anker (SFr1.5-2 million). The quality of the works cannot be disputed, which indicates that the estimated prices no longer reflect the reality of the market. To highlight the importance of the artists included in the sale, the event was branded “Topography of Swiss Art: The great names of Swiss painting through key places in their œuvre”. 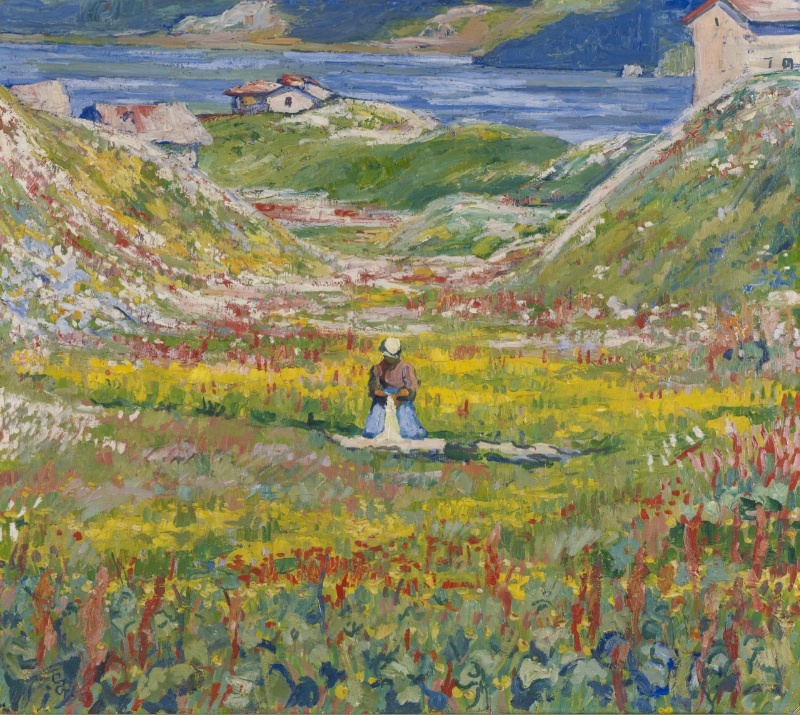 Buyers were offered an itinerary through Switzerland to “celebrate iconic places that inspired the greatest Swiss artists of the 18th, 19th and 20th centuries”, from canton Bern (Albert Anker) and the Engadin valley (Giovanni Giacometti) to the village of Savièse, “the location of a school of painting” (Philippe Biéler). By giving a theme to their sales, auctioneers are acting like the curators of an exhibition, a rather startling new trend. Lessons in art history accompany an increased presence and reliance on the web, which in turn help to educate new investors coming into the art market. “Until recently, many people did not realise that Swiss artists contributed significantly to all the major art movements,” Stéphanie Schleining Deschanel, director of Sotheby’s Swiss art department, told swissinfo.ch ahead of Monday’s sale. She pointed to Giovanni Giacometti, the father of sculptor Alberto, who, together with fellow painter and friend, Cuno Amiet, was a significant contributor to the Post-impressionist movement, or Max Sulzbachner, a proponent of Swiss Expressionism, the increasingly valued movement that was an offshoot of German Expressionism. “The interest in Swiss art is not confined to Switzerland. Collectors are discovering its diversity and universal appeal,” Schleining Deschanel said. The sale included oils by Albert Anker, a medium the artist abandoned when he was diminished by a stroke and took up watercolours. The popularity among patriotic collectors (see sidebar) of the realistic portraits of daily 19th century life by Anker has resulted in a spectacular rise in the price of his paintings. In December 2011, Anker’s The Elder Sister, was sold at a Koller auction for a record SFr7.38 million, almost twice its original estimate. Given the several-fold increase in their value in recent years, many paintings are coming on the market for the first time, released by families who, in keeping with the Swiss tradition of art collecting, had purchased the artwork directly from the artist. Sébastien Guex, a professor of economic history at Lausanne University, has published two studies on the Swiss art market. Although he does not profess to be an expert on Swiss art, nor can he advance any statistical evidence to explain the explosion of prices over the last ten years, he suggested to swissinfo.ch that it has to do with the consecration of Swiss art, now considered a sure value. Art speculation does not respond to the usual financial mechanisms, he insisted, which is why most banks have closed their art banking departments. Guex believes that there are many other Swiss artists, like Alice Bailly or Marius Borgeaud, whose values could also take off. “All it takes is several art collectors who take an interest in the same artist,” he explained. The recognition of Swiss art on an international scale, according to Paul-André Jaccard, director of the French-speaking branch of the Swiss Institute for Art Research, can be attributed to the “locomotive” Ferdinand Hodler, “rediscovered” by the American scholar, Robert Rosenblum in the 1970s. Over the years, paintings by Holder have broken the million franc barriers one after the other, reaching the ten million mark in 2007. Amiet, Giacometti and now Anker are following suit, a situation that Jaccard considers justified because these artists “are perfect representatives of the great and universal art of their times”. Jaccard however points out that although there is clearly a foreign market for Swiss art – as Sotheby’s upholds – he believes that international recognition has also generated an internal market, sometimes for unexpected reasons. He was recently told by an art merchant that the sudden interest in the Swiss Ecole de Savièse group of artists – with a major exhibition in Bern and Martigny dedicated to main figurehead Ernest Biéler – may have nothing to do with the art world at all. Instead, rich proprietors of chalets being built in canton Valais and who are looking for “authenticity” adorn their walls with this art. In the meantime, the art market in Switzerland needs to digest the brutal signal of a buyer’s market that may be slowing down. Giovanni Giacometti (Stampa 1868 – Glion 1933) and his close friend, Cuno Amiet (Solothurn 1868 – Oschwand 1961) are commonly referred to as Post-Impressionists, but the term “Swiss colorists” is also used to describe them because of their lavish use of luscious colors. Together with their elder Ferdinand Hodler (Bern 1853 – Geneva 1918), Giacometti and Amiet are considered the leading early modernist artists in Switzerland. Giovanni Giacometti was the father of Alberto and Diego Giacometti. Albert Anker (1831 – 1910) became a popular genre painter after studying theology. He was also a member of the Bern cantonal parliament. A major Anker retrospective at Kunstmuseum Bern took place in 2010. Anker is also very popular in Japan where four museums organized exhibitions in 2007-2008. The strongman of the rightwing Swiss People’s party, Christoph Blocher, is said to own the largest Anker collection in the world, with 180 works. He also owns ten Ferdinand Hodlers. Lac Léman vu de Saint-Prex (Lake Geneva from Saint-Prex), painted by Ferdinand Hodler in 1901 was sold for SFr10.9 million in 2007. The Swiss Institute for Art Research (SIK-ISEA) has recently published the Swiss Art Market: From the 19th Century to Today which highlights the role of Switzerland as a financial hub of the art market. American art critic Robert Rosenblum considered Hodler equal to Edvard Munch in his Modern Painting and the Northern Romantic Tradition, published in1975. The Ecole de Savièse was not so much a school of painting, as a group of artists, including Ernest Biéler, Albert Chavaz, Edouard and Marguerite Vallet and Marguerite Burnat-Provins who were inspired by Savièse, in the Valais near Sion. 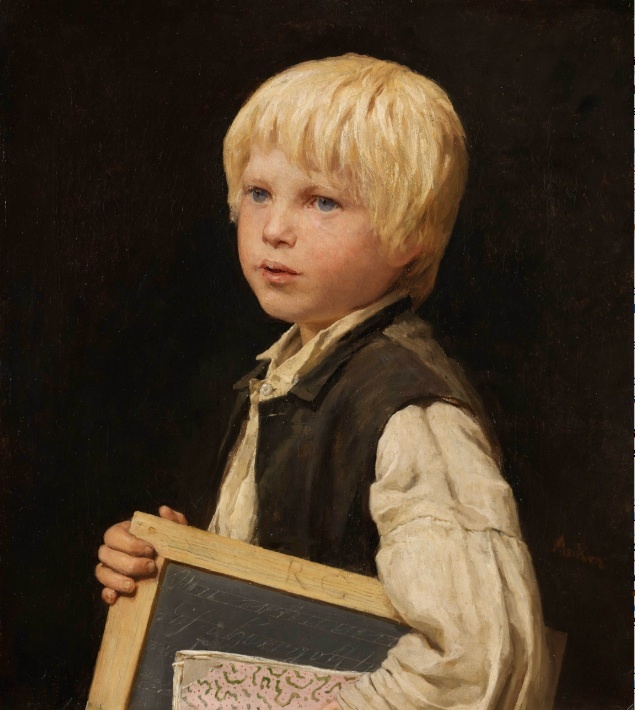 Koller auction house’s upcoming sale on June 22 will present a number of works “of the great artists who brought Switzerland to the forefront in the 19th century and first half of the 20th century”, including several by Anker. Christie’s organises Swiss art sales every nine months. The next sale is scheduled in September 2012. Dobiaschofsky Auktionen in Bern organises sales in May and November.